I got an email back on July 25th from an Acumatica customer with the title “Unbelievable!”. 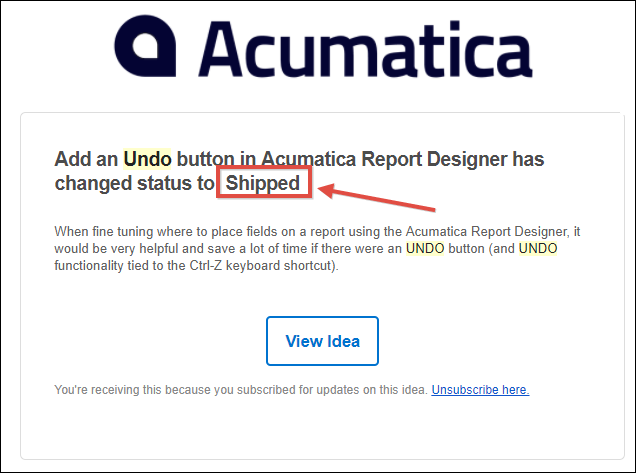 It was the first that I had heard of the Undo functionality officially making its way into the Acumatica Report Designer. On the same day, an MYOB Advanced partner started a topic in ARC Forums about the same thing (click here). But I was waiting to make this post until I saw something official on the Acumatica Ideas website. If you read the comments that were added after the status was changed to Shipped, you can see that it was shipped in Acumatica build 6.10.0680 and it also includes a zoom in / zoom out feature (I’m not sure what that is yet). So, it appears that the Undo button is actually available in version 6.10.0583 as far as I can tell. But, regardless of the build number, this is awesome. It makes me very happy! At the time of this writing, the Undo Feature is still the most popular request on the Acumatica Ideas website (click here), with 185 votes. You just won’t see it on the Popular tab anymore because the status has been changed to Shipped. The request for Undo Functionality was created back on December 9th, 2014. It took about 2.5 years for this feature to make it into the product. That’s not terrible. I’m not complaining too much. But I do have to say that there is a disconnect between Engineering and what people want. I’m also not complaining about this too much. There is always a disconnect between Engineering and what people want in software companies. Some companies though do it better than others. Power BI is my favorite example of a software product that has put its Engineering team in close contact with the user community. Their ideas website drives everything that they do. It’s displayed throughout the Power BI offices to keep the user community feature requests front and center. But this is not easy to do. There is a lot that goes into the execution. It takes a lot of time and money. I just wish that Acumatica paid closer attention to their Ideas website. I know that they don’t ignore it completely, but I wish that it got more attention. The most popular idea took over 2.5 years to make it into the product. I have no inside knowledge about whether or not this feature was actually in the product roadmap or somehow officially on the radar of the Engineering team. But I do have inside knowledge of how this feature got coded. Back at the Acumatica Summit in February in San Diego, there were two reporting training classes offered. The training classes take place Wednesday through Friday after the really important people have left (they only stay for the keynotes and parties on Monday and Tuesday). The first reporting class was aimed at end users (I taught that one) and the other class was aimed more at developers (Doug Johnson taught that one). The two classes were directly across the hall from each other. So, after the first day, I wandered over to the other reporting class and asked Doug Johnson how it went. He told me, “all you need to know is that Vladimir coded the undo feature” (or something like that, it’s not a 100% accurate direct quote). Then Vladimir came over with his laptop and showed me how he could move a field, then click the Undo button and it unmoved. Wow! I was amazed. It only took him one day to do that?!? Acumatica practices to have a developer in all of the training classes. Most of the time it’s dead time for the developer so they sit in the back and work on stuff, but when they chime in it’s very useful and everyone always benefits a lot from the exchanges. But the information does not just flow one-way. Case in point with the Undo feature. By sitting in the class, Vladimir realized how important this was to people. And since he wasn’t getting interrupted like he probably does at the office, he was able to focus and code the feature, all during the first day of class. Now, to be fair, there was still probably a lot of kinks to work out and QA to go through. But I did see it work at the end of that first day. If you look at the date on the AcumaticaReportDesigner.msi file in build 6.10.0583 (click here), you can see that it says May 22nd, 2017. The Summit was in early February. So that’s about 3 months for it to officially make it into the product which is not bad in my opinion. But it never would have happened without Vladimir Panchenko (at least that’s what I think). Many thanks to you Vladimir! I think this highlights the importance of in-person collaboration. 185 votes and over 2 years didn’t get this feature coded. Having a developer sit in a class for 1 day got this feature coded. Acumatica struggles with collaboration because they are so geographically distributed with the main development team in Russia, other development teams in Canada and Venezuela, and users all over the globe. That’s why I think the Ideas website is so important, a central online place to highlight what features are important to the community. But it cannot replace in-person collaboration. So, although I don’t think that Acumatica pays enough attention to the Ideas website, I am happy to see them do things like the Hackathon at the last Summit (click here), the virtual Developer Conference this past Summer (click here), and the training sessions that are offered in the United States throughout the year. I believe that a lot comes out of these kinds of gatherings.